Kimberly Munn is the creative force behind Maple and Belmont, a design studio based in Norfolk, Virginia that specializes in hand lettering. Maple and Belmont was born out of a dream to create stationery and other paper products with our own two hands. So in the fall of 2012, we rekindled our love of screen printing and got to work. Starting out primarily designing and screen printing stationery but quickly found our talents branching out into custom work that includes wedding invitations, chalkboards, logos, calligraphy services and anything we can get our hands on. Our work features Kimberly's charmingly, witty designs that explore our visual voice through hand-drawn typography and illustration. Our love of letterforms drives us to bring our patrons a level of quality and attention their project deserves. Kimberly also shares her love of hand lettering through several workshops that she teaches locally. Emily was raised in Norfolk, Virginia. She received her Bachelor of Arts from the School of Art, Design, and Art History at James Madison University through the Honors College with a concentration in metals. Along with her background in jewelry making, she has studied glass blowing at The Chrysler Museum of Art and The Corning Museum of Glass. With a minor degree in art history, she has worked regionally at several art institutions including the Heller Gallery and the Hollis Taggart Gallery in New York City. Emily's work, including jewelry, metalwork, hot sculpted and blown glass has been featured in exhibitions in the Chrysler Museum Glass Studio’s "Vestibule 102," San Francisco's Crafty's Competition jewelry finals, and most recently the Quirk Gallery. 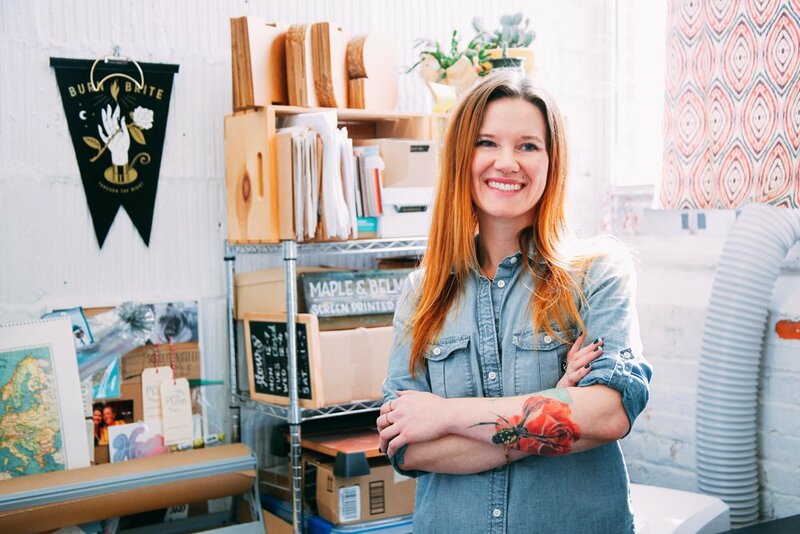 Her current studio practice resides in Richmond, Virginia at the Mule Barn Craft Studio, a collaborative workspace made up of metalsmiths, flame workers, and glass artists. I place a lot of value on the process of creation and spend intimate time with each piece. I use sterling silver, 14k and 24k gold, as well as 24k gold fill, 24k rose gold fill, and etched brass. Every stone and gem is naturally occurring, genuine, and unique. I enjoy making custom jewelry for all occasions because it allows for a more intentional relationship between the maker and wearer. Because each part is hand fabricated, sanded, polished, and bezeled, no two pieces are identical - I believe this to be the greatest mark of authenticity! My work incorporates historical styles, vintage themes, and architectural designs in attempt to glean elegance and meaning. The range of final product includes classic, whimsical, and sophisticated jewelry for both everyday wear and special occasions. By encompassing identity and time, jewelry becomes more than just its material worth and is instead symbolic to a degree that few other objects are. In this sense, it gains the ability to represent a relationship, remind us of a story, and be passed down to and from generations. As we move through our busy lives, the enigmatic pull of jewelry is something that continues to remind us we are still creatures of ritual and connection. Chapeaux Chaleureux was created in January 2017. A portion of all proceeds goes to materials needed to knit baby hats for the NICU at CHKD in Norfolk, VA. The idea initially started when I came across a video circulating on Facebook featuring an elderly man knitting hats for people in his community. I was inspired and decided to learn so I could do something similar here in Norfolk. On New Year's Eve 2016 I headed to my hometown of Williamsburg, VA to meet up with my childhood friend's mother at a Starbucks, where she spent a few hours teaching my mother and I how to knit with a loom. I completed my first hat that afternoon and was instantly hooked, no pun intended. On January 15th, I knit my first baby hat, and my plan shifted from knitting hats for the community to knitting baby hats for the NICU where I had been volunteering as a Cuddler since August 2016. One thing that has always been important to me is to find a way to give back to the world around me, and as is the case in many circumstances of giving back, I have always found that the experience gives me something invaluable in return. As a NICU Cuddler, I find joy in sharing love and care with a few very special babies. As someone who struggles with anxiety and ADHD, I find that knitting helps keep me calm and focused. Chapeaux Chaleureux serves as an outlet of creativity, love, healing, and hope, and I'm incredibly thankful for the opportunity to give back in such a unique way.